Sometimes our samples get visitors. In most cases, they’re simply little flecks of dust that have settled to the surface of our chips. Since most of the structures we’re making are so small, your average chunk of dust can be comparatively building-sized. They usually scare the willies out of me when I’m zoomed into my structure, scanning the microscope across, and suddenly one of them looms into the field of view like a giant monster. Sometimes the force of the electron beam from the microscope actually makes them move a little, and they seem to be reaching out to get me. 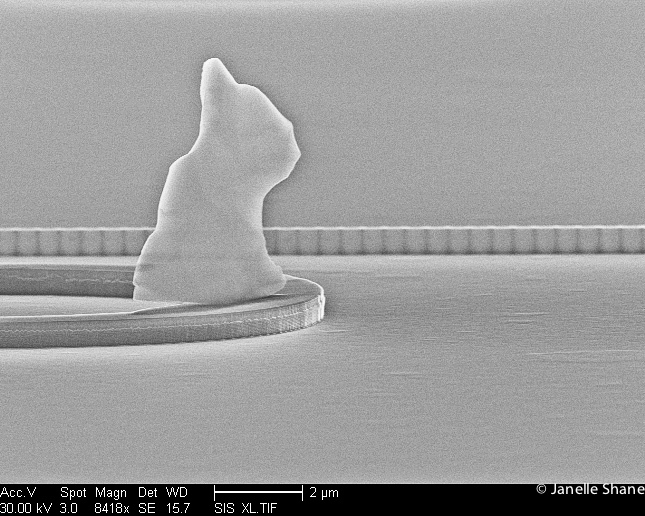 In this case, the dust bunny (it really does look kind of bunny-shaped) seems to almost float serenely above the surface of my sample, looking out over the long, long wall of laser material. It’s perched respectfully on one of my labels so as not to interfere with my experiment – a very well-behaved dust bunny. They’re not always well-behaved. There’s another researcher in my group who has to triple- and quadruple-clean all her glassware and beakers in some of the most caustic chemicals you can imagine, because a single errant particle of dust would cause her samples to fall apart. 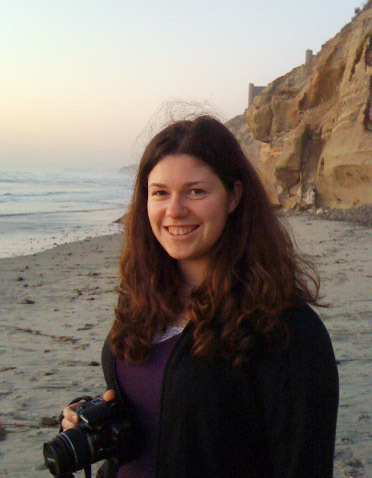 Read more of Janelle’s “Postcards from the Frontiers of Science” on her blog. I’m a 5th-year PhD student in the Electrical Engineering department at UCSD, where I study nano-optics. As part of CIAN, I’m working on ways to make microscopic optical components (such as nanolasers) that can help computer chips communicate more quickly within and between each other, using light. I’m also involved in outreach through CIAN, and I maintain a blog (lewisandquark.tumblr.com) where I post images from my research lab. I hope that through these I can give people an idea of what I like about being an optics grad student – in my case, I like building worlds, whether it’s a nanoscale landscape, or a computer program, or an optics setup, and I like thinking about how to make these worlds more elegant and intuitive. This entry was posted in Research and tagged cian, dust bunny, education, microscopic, optics, research, science. Bookmark the permalink.